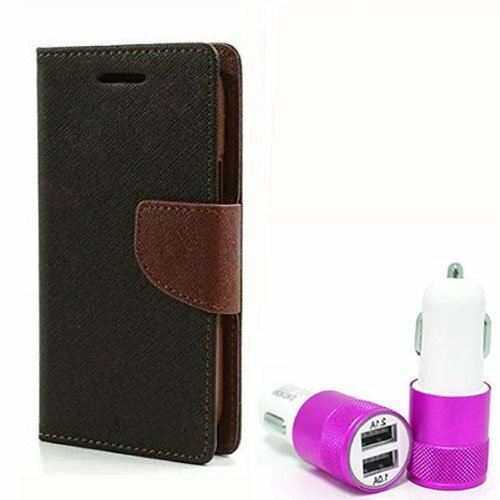 Aart Fancy Diary Card Wallet Flip Case Back Cover For Mircomax A104 - (Blackbrown) + Dual ports USB car Charger With Ultra Power Technolgy by Aart Store. @395 Rs [Mrp:-700] - Onlinedeals.discount - A leading product discovery website. Find the true prices of products, read reviews and buy top brand products at reasonable prices. Keeps your phone secure from everyday damages. This diary flip case for Mobile is stylish, colorful and offers complete protection for your phone. It is easy to install and remove, made up of high-quality, lightweight material and has a unique magnetic lock system. The case has 2 card slots as well. The versatile design makes this flip cover very useful in carrying things like your credit cards, visiting cards, currency notes etc. USB Car Charger with Super fast Charging ability. You can charger your iPhone, iPad, Android mobile phone and tablet with this unique gadget. Title Aart Fancy Diary Card Wallet Flip Case Back Cover For Mircomax A104 – (Blackbrown) + Dual ports USB car Charger With Ultra Power Technolgy by Aart Store.